Every Friday we're pleased to offer Legacy Family Tree Webinar subscribers a new bonus webinar just for them! This Friday enjoy "Creative Workflow in Lightroom: The Photographers Guide to Editing Photos The Easy Way" by Jared Hodges. If you're not a member, remember the webinar previews are always free. 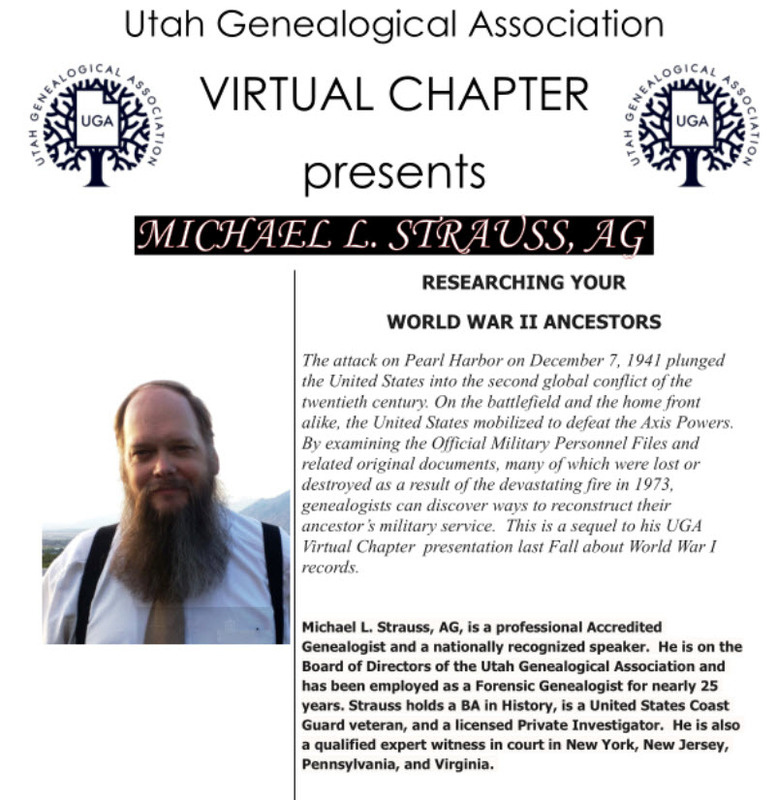 Free and open to the public: Utah Genealogical Association Virtual Chapter webinar is tonight June 21st, 7-8:00pm MDT. Join us each month on the third Thursday for free virtual presentations. Past recordings of webinars are available to members only, but the live webinars are open to all. The recording of today's webinar, "You Need a Search Strategy: Maximizing Your Results with Online Genealogical Databases” by Mike Mansfield is now available to view at www.FamilyTreeWebinars.com for free for a limited time. In the past 20 years, online search systems, databases, and image collections have revolutionized family history and genealogical research making our work faster, easier, and more convenient. However, these databases are not without limitations and quirks. This webinar will discuss some limitations we face and present strategies for more effective searches across a spectrum of websites and online services. If you could not make it to the live event or just want to watch it again, the 1 hour 22 minute recording of "You Need a Search Strategy: Maximizing Your Results with Online Genealogical Databases” is now available to view in our webinar library for free for a limited time. Or watch it at your convenience with an annual or monthly webinar membership. Join us, the Board for Certification of Genealogists, and Sara A. Scribner, CG for the live webinar Tuesday, June 19, 2018 at 8pm Eastern U.S. Register today to reserve your virtual seat. Registration is free but space is limited to the first 1,000 people to join that day. When you join, if you receive a message that the webinar is full, you know we've reached the 1,000 limit, so we invite you to view the recording which should be published to the webinar archives within an hour or two of the event's conclusion.